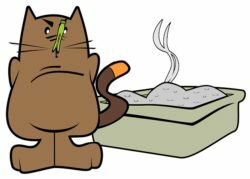 To keep the litter box odorless is a challenge for cat owners whose cats have stinky feces or for multi-cat owners who deal with more cat waste. The first thing we need to understand is that the source of bad odors is bacteria. 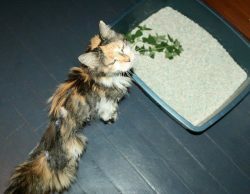 Odor-producing bacteria is present in the litter box as well as in all the organic elements that can develop bacteria. So our goal is to eliminate bacteria or at least keep it at bay, not allowing the bacteria to flow in the air which causes the stinkiness in the house. 1. Don’t let the urine or feces sit in the litter box longer than 12 hours. 2. Humidity is a litter box’s enemy. Keep the litter box in a room with low humidity. 3. 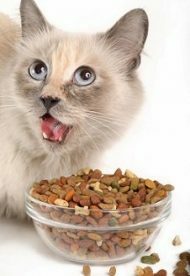 Change your cat’s diet if your cat eats too much grains or by-products. 5. 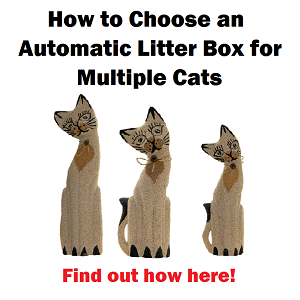 Choose a fast dissicating litter and pour the right amount in the litter box. 7. 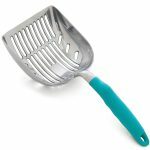 Get a metal scoop, with slighly rounded corners and narrow small holes. 8. Change the litter once a month with one cat. 9. Wash and disinfect the litter box once a month and the scoop every two weeks. 10. 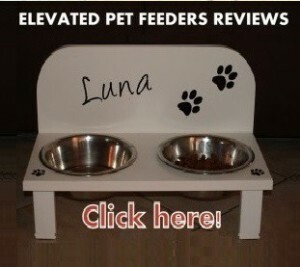 Get a large litter mat covering an extensive area of the litter box. 11. Change the litter box once a year if possible. 12. If the odor is stubborn, tech comes in handy. Get a UV light device. This has a biological reason. 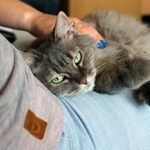 If you let the feces or urine sit for too long, the bacteria starts emanating to more extensive areas, not only in the litter box but also outside of it. When bacteria goes to the air, it gets stuck on walls, floors and furniture and overtime the smell can be very strong. To get rid of smell that has been attached to surfaces in the house it’s not that easy. Scooping every 12 hours is enough time to keep the odor-causing bacteria at bay. 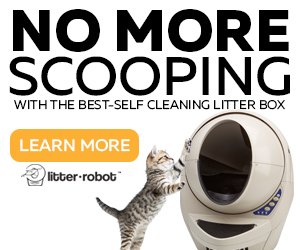 If you don’t have time to keep up with the scooping task you can get automatic litter box that will do this job for you. 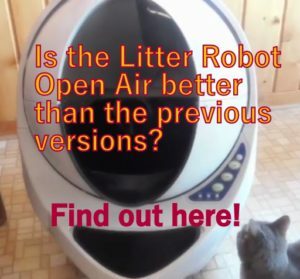 However, if you really want to forget completely about the litter box you must choose a reliable automatic litter box such as the Litter Robot, otherwise, the solution may be worse than the problem. 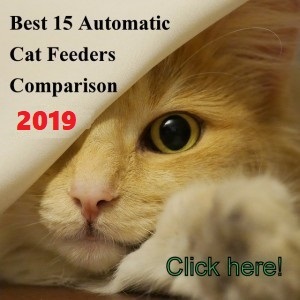 If you are willing to keep scooping the litter box but you just need a system to speed up the process, a good option is a sifting litter box such as the Trixie Berto which separates the clumps from the clean litter, making the scooping task much faster. Odor-causing bacteria reproduces faster and much more when in a humid environment. Keeping the litter box in a dry, low-humidity environment, less than 30%, will stop the bacteria from growing and this will keep the litter box almost odorless if using the proper litter. You can use a dehumidifier or running a fan close to the litter box. Locating the litter box close to a window or terrace door also helps. The size of the room it’s also important. When the room where you put the litter box is small, more chances that the litter box will develop bacteria in it, due to the lack of ventilation. 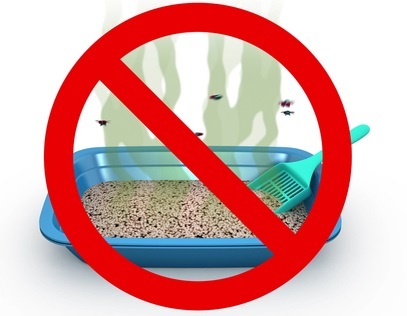 Because of to the friendship between odor-causing bacteria and humidity, is not recommended locating the litter box close to a kitchen or bathroom or in places with lack of ventilation. Humidity also affects the effectiveness of the litter you use. Most litters need dry air to work effectively, excess of humidity makes the litter lose part of its desiccating properties. When cats eat a food containing by-products and too much grains their feces are more abundant and more stinky. A bad cat food means a cat with a less healthy digestive system, creating more gas, and much more strong stools. Make an effort and get your cat a good quality dry cat food, containing a good source of proteins, avoiding fish in the first 3 ingredients. Also, try not to feed your cat the same type of protein for too long, make some changes in between to avoid food allergies. When changing the cat food you must do it slowly, mixing with the old food, otherwise your cat will experience diarrhea that will create more stinky feces. When it comes to foods, it will all depend on the cat and its overall health condition. You will have to go to the trial-and-error method until you find a quality cat food that will make your cat healthy and happy. When cats eat a healthy cat food, they eat more proteins so they need to drink more water, otherwise, the urine can be strong. Feeding a cat a healthy food goes hand in hand with increasing the cat’s water intake. This will keep the cat’s urinary system healthy and will reduce the ammonia concentration in the urine. You cannot feed your cat a healthy cat food without increasing the water intake. 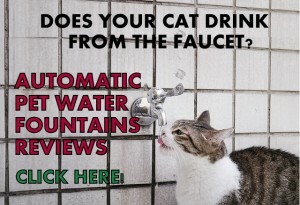 You can achieve this by getting a pet water fountain that entices your cat to drink more. There are several types of cat litters with clumping, desiccating properties. Some litters use Bentonite, others, silica gel and others, zeolite. 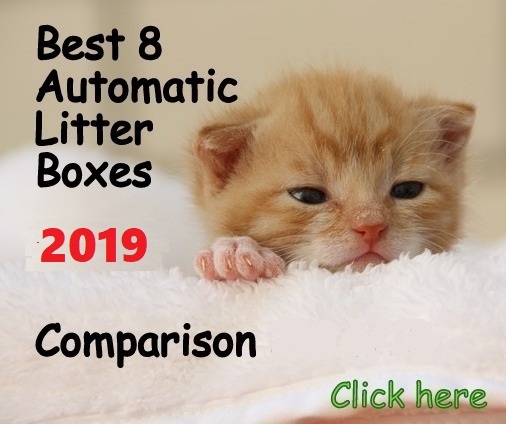 Most good cat litters have applied modern technology combining some of these components to get the a litter with the best clumping and antimicrobial capabilities, adding baking soda or carbon charcoal to the formula to control odors. The clumping capability of the litter it’s important because the firmer the clumps, the least chance to break it down when scooping. When clumps break down easily, the small tiny lumps that the scoop doesn’t catch, get mixed with the clean litter which causes the whole litter box to smell. Also, when the clumps are well sealed, they keep the humidity on the surface, not getting into deeper layers of the litter bed. In my opinion, the best clumping cat litters are the ones that use Bentonite clay, adding baking soda or charcoal to the formula. For example, Ever Clean Premium cat litter uses an advance formula where the carbon goes through a process that puts the carbon inside the clay granules. 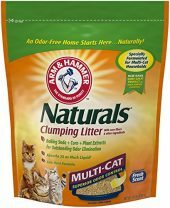 If you are into natural litters, there are some choices of natural litters that can clump and control odors, such as the Arm & Hammer Naturals that is made with natural wood fibers, plant-based clumping agents, minerals, and baking soda with artificial scent and preservatives added. Whatever the litter you choose, make sure it has good desiccating properties which means the capacity of drying and sealing the humidity of the stools and urine to keep odor-causing bacteria at bay. A very important point is using the right amount of litter. Most people think that using a lot of litter will help to reduce odors but sometimes it’s the opposite. When people use a large amount of litter the scooping gets harder. Catching all the clumps at the bottom is not easy and most likely some clumps will be stuck at the bottom without getting scooped, creating more odor problems. Using too little is also not good. When using too little part of the urine goes to the plastic bottom of the litter box much more, and even if you wash the litter box often this contact still exists and it will buildup bacteria in the bottom plastic sooner than later. Using a medium amount of litter of 2 ½ to 3 inches is the best approach in my opinion. Top the litter box off with new litter every 2-3 days, this will help to contain the odors as well. To avoid carrying the big bag or box with litter every time, make sure to store a fair amount of litter in a smaller bucket with lid or similar and pour some in the litter box every two or three days after scooping. You must choose a litter box that is not only big enough to accommodate your cat nicely but also a litter box that is cleaning-friendly. This means a litter box that has a smooth bottom and corners that makes it easier to scoop and catch everything you need to catch with the scoop. 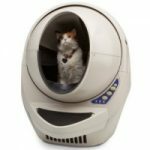 When the litter box has nooks in corners or the bottom we know what happens: dirty litter gets stuck in there and it’s almost impossible to clean it completely. Also, try to get a litter box which corners are not too sharp, slightly rounded. Also, avoid the litter boxes that have attached top parts that create a leaking seam between the top part and the litter box. This can cause litter box accidents if some urine goes against the wall, right on the seam. 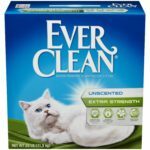 This item is highly overlooked but the scoop is really important to properly clean the litter box. Metal scoops harbor less bacteria and are more hygienic. Also, they are stronger when scraping the litter box and don’t bend. Choose one with slightly rounded corners that will allow an easier scraping in the corners and with narrow small holes so it catches the smallest lumps, but not too small that won’t sift efficiently. I suggest getting the metal DuraScoop. It’s a good idea to change the litter after 3 weeks, because after this period of time the litter is not clean anymore and it contains germs that cause odors. Also, it’s unhealthy for a cat to step on soiled litter, so it is safe to change it completely. If you have 2 cats you need to change the litter every 2 weeks. You need to keep the hygiene of the litter box periodically to avoid bacteria buildup on the plastic and scoop. Cats are very sensitive to chemical so try to use a natural antibacterial cleaner or a very tiny amount of chlorine rinsing thoroughly. Wash the scoop every two weeks, and make sure to use gloves. Eliminate the yucky part of the scoop with a dump paper towel before washing it. Disinfect with a natural disinfecting or use a couple of drops of bleach and rinse thoroughly. Wash the litter box every month to keep the plastic free of odor-causing bacteria. You can’t use the same litter box forever. Plastic litter boxes are not expensive so try to change your cat’s litter box at least once a year. Cat’s urine is strong and overtime it decays the plastic, allowing bacteria inside it which makes it almost impossible to get rid of bad smell. 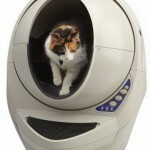 Additionally, your cat will be happy with a new toilet. When cats dig, a lot of dirty litter goes to the floor. This is also a source of bacteria that gets harbored if we don’t keep the litter area protected from dirty litter and also from litter box accidents. Usually litter mats are small, covering only the litter box and adding only a couple of inches extra. You need to get the best litter mat which are made from rubber and with a good size that cover most of the area where litter goes onto. This keeps the odor-causing bacteria away from the floor or the carpet. If all these measurements are not enough and your cat’s litter box still stinks up the whole room, you may want to check an UV light device. Ultra violet lights are well known to kill any type of bacteria and also fungus, so it may be a good investment if the cat’s litter box is a real problem in your home. UV light devices that cover extensive areas are more expensive than the plug-in type. If you notice your house is really smelly and has been like that for a long time, you may want to get a UV light device that covers the whole room, sanitazing the surfaces, walls, floors and of course, the air. If you just want to get rid of the smell that is directly above the cat’s litter box, you may want to check for a UV-C light device that plugs in the wall and kills the emanating bacteria of the area where the litter box is located. The UV-C light uses short-wave ultraviolet radiation in the “C” band, which is 200 to 280 nanometres. To keep the litter box odorless may take only two or three of the steps described in this article. But if your cat’s litter box is really a stinky and stubborn problem, you may need to take most part of these steps. If you do so, you will have a guaranteed odorless litter box.